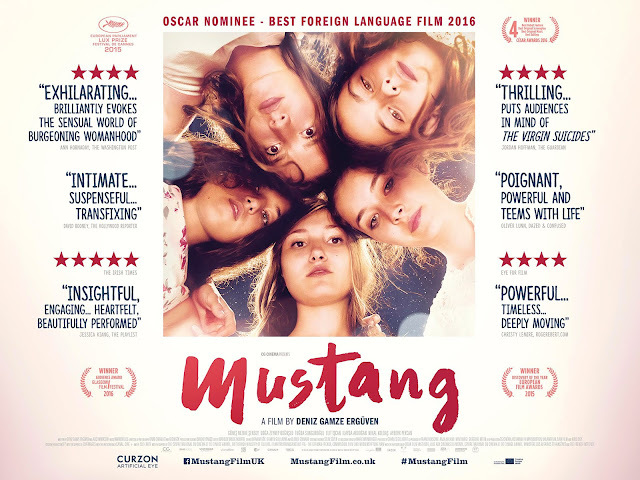 "Mustang is a 2015 internationally co-produced drama film directed by Turkish-French film director Deniz Gamze Ergüven. The film is set in a remote Turkish village and depicts the lives of five young orphaned sisters and challenges they face growing up as girls in a conservative society. The event that triggers the family backlash against the five sisters at the beginning of the film is based on Ergüven's personal life. It was screened in the Directors' Fortnight section at the 2015 Cannes Film Festival where it won the Europa Cinemas Label Award. Mustang is the first feature film directed by Deniz Gamze Ergüven. It won the 2015 Lux Prize. It was selected to be screened in the Special Presentations section of the 2015 Toronto International Film Festival. The film won Polish Filmmakers' Association Award for Best Feature Movie at the 33rd Ale Kino! Festival. The film was nominated for the Best Foreign Language Film at the 88th Academy Awards. It was also nominated for a Golden Globe Award for Best Foreign Language Film. It received nine nominations at the 41st César Awards, and won four, for Best First Feature Film, Best Original Screenplay, Best Editing and Best Original Music. Mustang has received widespread critical praise." "The film starts with Lale, the youngest of the five sisters and the protagonist, bidding an emotional farewell at school to her female teacher, who is moving to Istanbul. The sisters decide to walk home instead of taking a van to enjoy the sunny day. Along the way, they play in the water at the beach with their classmates. For one game, they sit on boys' shoulders and try to knock each other off. When they reach home, their grandmother scolds and hits them for their having this kind of bodily contact with boys and thus ""pleasuring themselves"" with them. Their uncle Erol is equally furious. From then on, the girls are kept from leaving the house, even for school. Lale, who loves football, is forbidden from attending Trabzonspor matches. She resolves to go to a match from which men have been banned due to hooliganism. A friend tells her that the girls in the village are going together on a bus. The sisters, who are happy for an opportunity to leave the house, sneak out of the house with Lale. When they miss the bus, they hitch a ride with a passing truck driver, Yasin, who helps them catch up to it. They’re ecstatic in the exuberant atmosphere of the all-female crowd cheering for their team. Back home, their aunt catches a glimpse of them at the match on TV, just as their uncle and other village men are about to tune in. To prevent the men from finding out, she cuts the house's, and then the whole village's, electricity. When the girls return, their grandmother decides to start marrying the sisters off. They’re taken to town, ostensibly ""to get lemonade"", which is actually an opportunity to show them off to potential suitors. Soon enough, a suitor and his family arrive to meet them. Sonay vows to only marry her lover and refuses to meet the prospective suitor and his family. Selma is sent instead and becomes engaged. Sonay gets engaged a short while later to her lover. At the two sisters' joint wedding, Sonay is clearly happy while Selma is not. On the morning after her wedding, Selma's in-laws come to view the bed sheets in a traditional ritual to establish that Selma was a virgin before her wedding night. Because there is no blood on the sheet, her in-laws take her to a physician to have her virginity tested. It becomes evident that the uncle starts abusing Nur as well and that their grandmother knows about it. She says that now it is time for her to be married off. Though she is young, she is found a suitor and engaged to be married. On the night of Nur's wedding, Lale convinces her to resist, and the girls bar themselves inside the house while the whole wedding party is outside, much to the embarrassment of their family. As the wedding party disperses, their uncle violently tries to get inside. Lale finds the phone hidden in a cupboard and plugs it in to call Yasin for help. The girls gather up money and a few supplies, grab the uncle's car keys, and sneak out of the house. They manage to escape in the car, crashing it close to their house. They hide and wait for Yasin, who picks them up and takes them to the local bus station. The girls take the bus to Istanbul, where they find their former teacher, who greets them warmly."